Hanes Girls' Bras looks pretty and feels comfortable, making this a great first underwear bra for her. 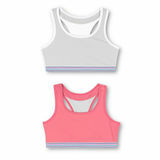 Your daughter will incredibly comfortable while wearing this Hanes Girls' Bras. These bra provides the best shaping and modesty. They've covered the comfort, they've covered the fit and they've covered the style! Absolutely perfect-all the way around. The colors and the silhouttes are fantastic for a girl. 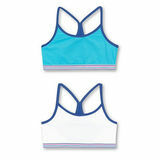 These bra also has adjustable straps, and excellent quality. Available in a variety of basic colors. I love that Hanes as embraced this young girl and has made bra time fun, exciting chic and ultra-girly!The bras are very well finished, very beautiful and comfortable!!! Perfect fit for a teenager.